A native of Powell River, Canada, Madeline Hocking has established herself as a dynamic performer throughout North America and Europe. She has partaken in music festivals throughout the world, such as the Zodiac festival of Southern France, the Banff Centre Strings Masterclass program, Orford Arts Centre, Bang on a Can, Saltspring Island Chamber Music Festival, National Youth Orchestra of Canada, and the Pacific Regional International Summer Music Academy. A passionate chamber musician, she has played in ensembles throughout Canada, the US, Scotland, France and Denmark, in genres varying from contemporary classical to celtic fiddle. Some of her most recent projects have included studies at the Royal Danish Academy of Music in Copenhagen, and a piano-violin recital in Brooklyn, New York. These days, in addition to maintaining an active performance schedule, she teaches violin at Cecilia & Kevin Music Studio in Richmond, British Columbia. She holds a Bachelor of Music degree from the San Francisco Conservatory of Music (class of 2017), where she studied with Wei He and Ian Swensen. Other private teachers have included Eszter Haffer, Nicholas Wright, Mary Sokol-Brown, and Cathy Reckenberg. When not playing the violin, she can likely be found in the mountains hiking, reading a book, playing piano, or practicing combat sports. 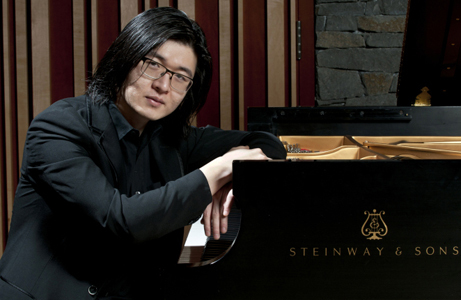 Pianist Sunny Qu was born in Qingdao, China and later raised in Vancouver, Canada. Sunny began piano lessons at an early age, and has met with success and recognition in competitions and festivals since his teenage years. Since then he has performed on three continents in such venues as the Weiner Salle in Salzburg, Austria, Duke’s Hall in London, England, and the Chan Centre in his native Vancouver, as well as being invited to perform in the Russian Embassy of Osaka, Japan on a special occasion. Equally at home with repertoire from the Baroque period to the modern day, Sunny is known for eclectic to approach to programming innovative recitals with a link to the past. This has been cultivated by an interest in the composer and pianist Ferruccio Busoni. In addition to actively seeking out and performing Busoni’s lesser known compositions. Sunny was the third prize winner of the 2009 Knigge Competition, as well as a past winner of the UBC Concerto Competition. He has subsequently performed with the UBC Symphony Orchestra, as well as the West Coast Symphony Orchestra. In recent seasons, Sunny has appeared as soloist with the Vancouver Philharmonic Orchestra performing Rachmaninoff’s Piano Concerto no. 3 and with the BC Symphony Orchestra in Mozart’s Double Piano Concerto alongside his teacher, Sara Davis Buechner. He was the recipient of the Johann Strauss Foundation Award in 2009, and the Else Cross Brahms Prize from the Royal Academy of Music in London, England in 2013. Sunny was a graduate of the UBC School of Music and the Royal Academy of Music where he studied with Sara Davis Buechner and Hamish Milne. He then continued his studies with pianist and conductor Jeffrey Kahane at the University of Southern California. His past teachers include renowned pedagogue Edward Parker and concert pianist Ian Parker. He was also fortunate to receive guidance during his studies from such artists as Anton Kuerti, Robert Levin, Joanna MacGregor, Pascal Devoyon, and Steven Osborne. Please note that we follow the SD47 school calendar.